There’s something wonderfully iconic about sampling local Galapagos ceviche while gazing out onto a marine reserve, wandering through Santa Cruz Fish Market to find fur seals and pelicans stealing scraps, or enjoying some fine dining as the sun sets over the peak of a volcanic island. And there are plenty other scenes that could be painted with words, all with a similar theme. Eating fish in the Galapagos isn’t just about the freshness of the catch: it’s also about the fabulous setting. The best dishes are the ones that the local Galapaguenos eat. Ceviche is classic and consists of small chunks of raw fresh fish that’s been cured in a marinade consists of lime juice and chili. Tiradito is similar to ceviche and is made using fresh fish that’s been thinly sliced and then cured in a variety of juices. Tradition dictates that you should only eat these dishes for lunch, as the fishermen usually come back to shore in the morning and the fish must be served fresh. Another favorite for an easy meal is sancocho de pescado, which is a watery fish soup that is a popular starter or lunchtime snack. On a Galapagos cruise, you’ll have the chance to eat fresh seafood with almost every meal. Local chefs love to make appetizers from the fresh seafood, such as slices of octopus, fresh shrimp cocktails, and battered sole bits with salt and pepper. On most evenings there will be an option of grilled fish accompanied by soft fillets that have been charred over the coals. Join the pelicans and fur seals at the Santa Cruz Fish Market and you can view the fresh catch that ends up on the menu. The market is located at Pelican Bay and is within walking distance of the Finch Bay Galapagos Hotel and is a great place to see what’s on the monthly menu. The wild animals often come here to scavenge and steal, especially when the fishermen arrive with ice boxes stocked high with fish. By sidestepping the barking fur seals you might even find slipper lobster being sold from September to January. Throughout most of the year you’ll find shrimp and mountains of sea snails (churos), with traders constantly trying to stop the frigatebirds from stealing them. Mostly you’ll find semi-firm white-fleshed ocean fish, such as sea bass, grouper or flounder. All are delicious and are the best fish for ceviche and tiradito. In addition to all this, you might be eating oily and meatier ocean fish in the Galapagos, such as tuna. However, many of the larger oceanic species like Marlin are 100% protected – these are only for admiring with your eyes while snorkeling, not eating for dinner! You can dine at the Santa Cruz Fish Market in the evenings, which is an excellent place to sample cheap seafood of all varieties. There’s not much sauce or culinary panache here, just the taste of the ocean. Small local eateries can be found in Puerto Ayora, too. But eating fish in the Galapagos is all about the setting, which is just one reason we recommend a dinner at the Finch Bay Galapagos Hotel’s restaurant. Lounge out on by the pool, marvel at the seabirds swooping past, and settle down for a meal prepared by the archipelago’s most renowned chef. 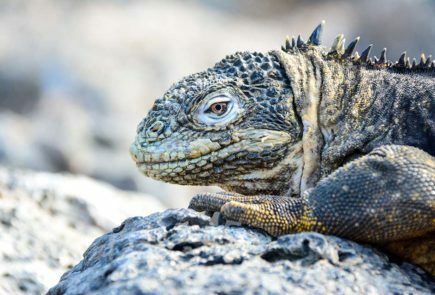 A Galapagos cruise elevates the experience even more. Returning from an excursion, guests will get to enjoy fresh sushi and sashimi snacks on the deck while looking out at colonies of fur seals, for example. A lunch consists of fresh sole is accompanied by the majestic sight of volcanic islands. On at least one of the days, the cruise chefs will barbecue a giant ocean fish and serve it up on the deck, accompanied by the smell of the salty oceanic air. After dinner, guests can take a drink upstairs and enjoy it under the stars and the sound of the waves relaxes the mind. In the Galapagos, guests will enjoy some of the world’s freshest fish, whether it be cured in lime juice or grilled over flames. And the best part? Your dining table is set in one of the most magical places in the Pacific Ocean.